Quiz Supper a HUGE Success! On Saturday 3rd June, Maxine, Helen and Alison proved that ladies really can multi-task, and how! OK, they did have a little help from family, friends and spouses. Their Quiz Supper was a great success from every point of view; we all had a great evening out and it raised another £1,100 for the Appeal. 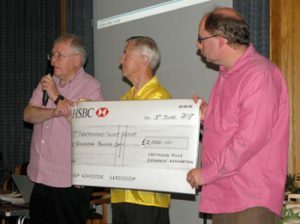 In addition, Andrew Riley, chairman of Northwood Hills Residents’ Association, presented GSL Mike Bennett with a very large cheque for £2,000. 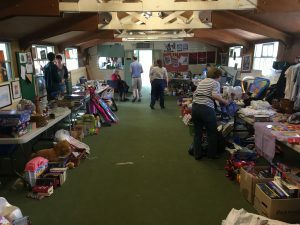 Northwood Lions Club raises loads of money at their Lions Den market every Saturday morning, all for local causes. 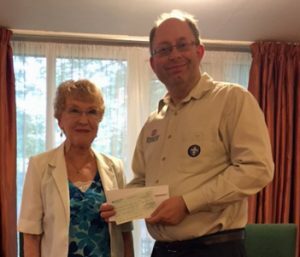 At a cheque presentation evening on Thursday 25th May, Lions Den manager, Olive Fairclough presented our GSL, Mike Bennett with a cheque for £2,000 – for the New Hut Appeal. Click here for more info about Northwood Lions and their Den. Sgt Ben Phipps goes the extra 6.2 miles! Congratulations and thanks to our local Police Sergeant who completed the Vitality 10k Run in 59mins 10secs yesterday, whilst raising £425 for the New Hut Appeal. Well done, Sharon & Wendy! 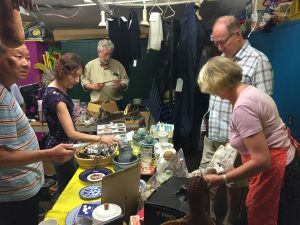 The latest Indoor Boot Sale at the Hut proved a great way to shift a lot of left-over Jumble. We could have done with more buyers, but a worthwhile £400 was raised for the Appeal. Thanks to all who made it happen, especially the Beavers and Scouts! See you at the next one, 25th June. On Thursday 11th May, one of our patrons, Cllr Carol Melvin, was elected Mayor of Hillingdon. 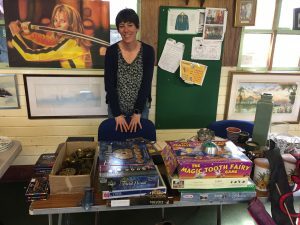 She announced that she will be supporting three charities during her year in office, one of which is The 1st Northwood New Scouting Centre Appeal! Thank you, Carol. 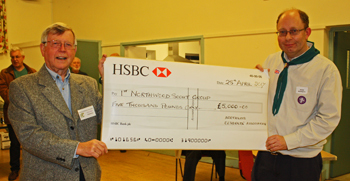 On Friday 28th April, Northwood Residents’ Association (NRA) presented a cheque for £5,000 as their contribution to 1st Northwood Scouts’ £100,000 Appeal for funds to build a new Scouting Centre. The occasion of the presentation was the NRA Road Stewards’ Social evening, which is organised every year as a small “thank you” to Road Stewards for all their hard work throughout the year. To mark National Tea Day on 21st April, Ros & Richard invited some friends and neighbours round for tea, cake and a good old natter – and raised £185 in donations. What an easy way to raise money! Many thanks to Maxine & Bob for setting the ball rolling by hosting a Big Night In dinner party on Good Friday. Each guest paid £10 towards the Appeal fund, so that’s another £100 in the bank for us and a fun evening for those taking part. Who’s next? Sam Jenkins has exceeded his sponsorship target of £274. 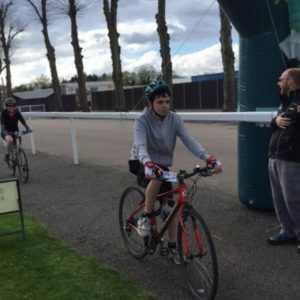 He took part in a sponsored 50 mile bike ride on 1st April; there is still time to make a donation. Click here to visit Sam’s My Donate page. Thank you for supporting the Appeal, Sam. ‘Easyfundraising’ is exactly what it says! This idea could raise us a great deal of money! All you have to do is register at www.easyfundraising.org.uk and select “1st Northwood Scouts New Hut Appeal” as your good cause. (Please note there is another Group on there with the same name as ours called “1st Northwood Scout Group” from Cowes on the Isle of Wight – please don’t select the wrong one!) Then whenever you make an online purchase at any of the stores listed on their site, such as Boots, Amazon, John Lewis, Expedia, Argos and hundreds more, you place your order via easyfundraising instead of going direct, and we get a donation. It costs you nothing, and gains us a lot of money. When you do sign up, please click the Donation Reminder facility, then if you were to forget to use easyfundraising and go direct to a site that qualifies, it will prompt you to go via the correct route. How clever is that!